Not only is vinyl a superior way to listen to music, but it also can be way more stylish! 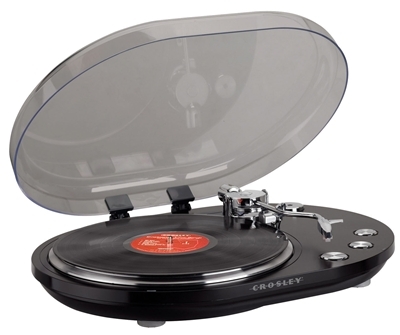 Bring a sleek, streamlined look into your home with Crosley's unique Oval USB turntable. This lustrous piece plays two record speeds and also converts vinyl to digital via USB, so you can finally archive those limited edition records that were sadly mixed in with the tennis rackets and skis in the basement. Not only will this turntable catch visitors' eyes, but the moving magnetic cartridge and durable plastic platter will make the most of your music.